Allied Health Professional Development Fund (AHPDF) was in search of a complete redesign of their entire website while also requesting a complete content management solution. 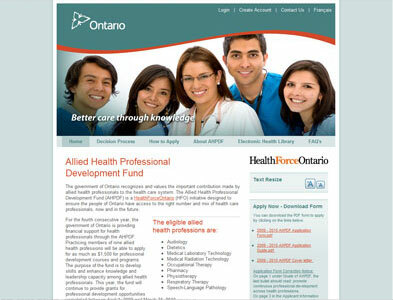 AHPDF was required to follow strict Ontario government design guidelines to present a clean and user-friendly website interface. Intrigue understood the requirements and created a very functional and beautiful website design. Intrigue was very pleased with the outcome, while AHPDF was provided with one of the industries strongest, most supported and secure content management systems. You can visit their site by browsing to www.ahpdf.ca or by clicking the images below.